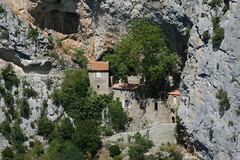 A walk along the gorges of Galamus to the Monastery of St Anthony. It’s not a long walk but spectacular and most of the time in shade. The afternoon has the best light for photography. Start by parking in the large carpark at the southern end of the gorge. The parking is free and there is even a free bus waiting to take us up to the Gorge. There is a second car park at the start of the walk but this is often full. There are numberous friendly guides to help. At the far end of the car park there are some steps down and we follow these carefully as the rocks are a bit slippery as they are so well worn with age. The path is a shaded walk amonst olive trees and you have good views of the monastery all along the path. It meanders around and then you climb up to the monastery itself. The whole place is carved out of the rocks and the chapel is especially wonderful and cool. A shaft of light comes in above the entrance and illuminates the subtle blues and creams of the limestone interior. It is dedicated to St Anthony and many pilgrims come this way. There is a shady cafe for refreshment and a good chance to unwind and watch the rock martins wheeling around the gorge interior. There is a dangerous little path down to the river if you want to paddle but we didn’t go there. The path continues on up through a tunnel in the rock and comes out at the half way point along the gorge road. You can walk on along the road that winds its way precariously along the edge of the cliff. Watch out for the strong winds! We turned back along the road and took the bus back to the car park. A day for some recipes. What does the Ravenous Rambler have for breakfast when in France? First a bowl of fruit, yoghurt and honey. 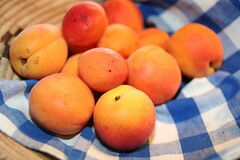 In this region of the Pyrenees, there are many fresh apricots that are in seasons and these chopped up with some white peaches make a good mixture with yoghurt and local honey. The tourist information in Axar has a food of the region annexe and there are about twenty different honey to choose from. They have thoughtfully laid out a tasting table where with the use of disposable spatulas you can taste many of the honeys from the mild to the very strong. There was my favourtite, acacia and lavender, then chestnut honey which was far too strong for my liking. Earlier in the morning I went to the boulangerie to collect our daily order of baguette and croissants and we usually polish off the croissant and apricot jam with a pot of coffee to complete the perfect rambling breakfast. I found this recipe in a French magazine and have adapted it for my own pleasure. Marinade the fruit in the lemon juice, sugar and rum ( I had to substitute this with white wine) for about 30 minutes. I boiled up the mixture for a minute or two. Put the fruit on skewers and place them on the barbecue for a minute or two to char slightly and decorate with the pistachios. I served with with yoghurt of course and I must say it was rather delicious. A useful guide to good spots for bird watching. Travellers Nature Guides, France,; Bob Gibbons. Interesting nature recommendations – geology, trees, birds and wildlife. A good buy. This is an excellent story set in Kenya and is the race between two genetlemen to see the most birds in a week. The prize is a chance to take thier belle to the ball. The world according to Bertie by Alexander McCall-Smith. A delightful tale about the people who live in the same block in Edinburgh. A story of love and happenings. This is to help me with my book writing enterprise but I can recommend this whole series. Re-eading this delighful evocation of the wild places of Britain. I have never mastered the Sicilian defence in chess and this is a good introduction with some readable analayis and several example games. An evocative account of the history and fascination with mountaineering. Not sure how much of this is true but a gruelling soldier’s account of the British Army trying to keep Indonesaian rebels out of Malaya in 1963. An unexpected find on the reading shelf! Beauitiful paintings of the Cathar region in water colours. I bought this for inspiration and it worked as it really got me painting when I wasn’t writing! Well it was up early with the croissants and off to explore some chateaux under a rather grey sky. I am loathe to admit, whilst on holiday in the South of France, that it had been raining during the night but yes the morning was distinctly miserable and several cups of tea did nothing to shift the misery. First stop was the Chateau de Queribus and it was still early so not too many people about. The road winds up the hill near the village of Cucugan. 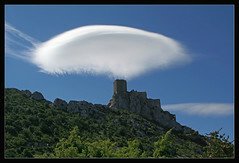 It was a refuge for Cathar deacons as late as 1241 and was eventually made into a royal palace. The site itself is a spectacular hill fortress and the path winds up the side and one is blown away by the wind that wraps itself around the hill as I reached the gateway. It was a struggle to pull myself up the final steps and then you feel safe within the castle walls. If I was part of a marauding enemy, of course, I would feel anything but safe as the arrow slits are lined up for a ‘shoot to kill’ policy and the usual traps over the gateways where they could pour boiling hot tea down onto your head. Not my sort of welcome. It is hard to believe that this castle could have been built on such a high point of a mountain but stands here it does and there are a whole load of stairways and passages to explore and magnificent views out across the Rousillon plain. The mountains of Canigou were pushing their tops into the cloud cover and I imagine it would look wonderful in the depths of winter. Back at the kiosk we had one of the worst cups of coffee that France has ever produced before retiring to the car for the croissants and a chance to admire the beautiful lenticular clouds that were hanging around over the hills. They are formed from the air moving in a wave like flow over the mountain tops and produce the wonderfully smooth clouds that look like martian flying saucers in the sky. Such peaceful thoughts were interrupted by two coaches arriving and discouraging hundreds of people. I wondered how many of them would notice the lenticular clouds? On to Aguilar Chateau and there was no one there so we could have a really good look round this lovely small fort outpost set amongst some vineyards over the plains of Tuchen. Finally, and there are only so many chateaux you can take in a day, to the Royal Fortress of Peyrepertuse. This was the biggest so far and very popular. This is a real ‘Buy one, get one free’ as it consists of two castles but maybe that’s why they charge almost twice the admission price of a normal castle! According to the blurb, it’s, ‘ an essential element in the French Kingdom’s defense system against Aragon’. It occurs to me that then they had the crusades and now we have the ‘war on terror’. Nothing much has changed. They had the Spanish Inquisition and we have tube bombers. There are many narrow paths around the Chateau of Peyrepertuse and this means that one is continually having to give way to people on narrow staircases, let people overtake or overtake others if I consider they are going too slow. I never like this mixing with so many people and inevitably I get very annoyed by just these other people and their lack of politeness. People who tread hard on your heels, then when you turn round and say, ‘après vous’, they say decline and say, ‘non, ‘après VOUS’, but then they still stay hard on your heels and you think what are they up to? Then there are others who are walking towards you on a narrow ledge so when I stand aside to let them pass, they look through you and don’t say a word. I wish I hadn’t bothered! This evening we cooked fresh moule marinere. Melt the chopped onions in some butter and add the wine. Clean up the mussels and remove any ‘beard’ like attachments. Throw away any mussels that are open. Heat up the onion and wine mixture until boiling in a large pan , add the mussels and put the lid on to steam them. After about 5-10 minutes most of them will have opened. 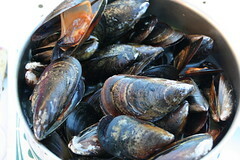 Eat them from the pan, using one mussel as a pair of tweezers. Eat with fresh bread and dip the bread into the ‘soup’. Throw away any mussels that are closed. Delicious with a glass of Fitou red wine. No, not me – my cycling is not up to it but the tour did go right past our Gîte. They closed the road from 11.00am so we camped out at the gate with a cup of coffee and a book to read. At first, all was quiet on this otherwise busy road. Then the entourage started coming through. First Gendarmerie with their blues and twos going. Then convoys of advertising support floats with music, megaphones and displays. As they go past they throw freebies out – we collected a whole pile of hats, key rings, bags, packs of cards, washing powder, more key rings, paper megaphones and so on. Then more police and support vehicles. These convoys went on for about an hour, then it all went quiet once more. One car stopped opposite us and six men got out to have an impromptu picnic. We could tell that the race was a while away. More police and support vehicles went past. The picnic people packed up and gave us the rest of their food – some excellent cutlery and glasses – and their rubbish! More police and announcing ‘three minutes…’ more motorcyclists and police… helicopters went over, still they didn’t come… then another helicopter and this was it. Suddenly the two leaders came through surrounded by support vehicles. Thirty seconds goes by and then the pack flash through, I steady my camera and fire away until I get the annoying message – ‘busy’ I had taken too many for the buffer to hold..and then they were gone in a stream of more support vehicles. We collected up all the extra bags and hats from the bushes and retired inside to watch the rest on TV. 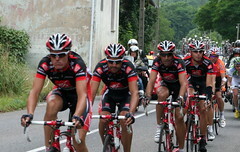 The two leaders kept out in front all the way to Narbonne to be overtaken by the pack a few kilometres from the end. Then, with 100 metres to go things hotted up on the home run and it was very satisfying to see our Mark Cavendish win the stage in a last ditch sprint. The Ravenous Rambler goes en randonnée. All went well with a lovely drive down to Dover and a traditional P & O boat crossing on an azure sea and the white cliffs retreated into the distance over an awful tasting coffee from the on board costa coffee bar. Do they get everywhere? The motorways opened up for a trouble free journey down towards Paris. We were aiming for Orleans to stay overnight ready for the next day’s trip down to the South. Then I realised that there was a major malfunction in the planning. Whilst the 14th July has no relevance to us Brits, here in France it was a big holiday weekend and we ran into it at Paris. The peasants were revolting with a mass walk out from their businesses and to our horror were all on the road. The motorway was down to a snail’s pace and got worst all the way through. It took us about 2-3 hours just to get out of Paris and as it was now approaching the evening we decided enough was enough and pulled off the motorway to stay in a Campanile on the outskirts of Paris. They are jolly hotels where you can park outside like a motel. The food is excellent and we had a selection of salads followed by a seafood pasta. The Ravenous Rambler was full of joie de vivre. Forcing rhubarb is a barbaric practice carried out by primitive tribes in the north of England. This cruel torture is performed to create early sweeter rhubarb stalks. They do this in darkened sheds operating only by candlelight. It’s time to bring it out in the open. Stand up for rhubarb freedom! 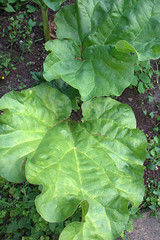 I love eating rhubarb but I have been looking for an alternative from cooking in water which makes the Rhubarb mushy. When I saw Hugh Fernley-Wittingstall baking them with honey I couldn’t wait to try it out and it worked brilliantly. Chop up the rhubarb is chunks and put in a baking tray. Pour the honey over the top and bake at about 100C for thirty minutes until the rhuarb is soft. Serve with ice-cream or yoghurt.